He joined the Warsaw Aero Club in 1926 and was already an experienced pilot when, following compulsory army service, he entered the Polish Air Force. By 1935 he was an officer serving in No. 1 Air Wing in Warsaw. In 1938 Glowacki completed a specialist course at the Air Force Academy at Deblin and remained there as an instructor. He did not fly in the September 1939 campaign and escaped to Romania when it ended. He made his way to France by sea but elected to continue on to England and joined the RAFVR on 29th January 1940. Glowacki was posted from the Polish Depot at 3 School of Technical Training Blackpool to No. 1 School of Army Co-operation at Old Sarum on 5th July 1940 for No. 1 Polish Pilots Course. He arrived at 6 OTU Sutton Bridge on 14th July and was promoted from Corporal to Sergeant. After converting to Hurricanes Glowacki joined 501 Squadron at Gravesend on 6th August 1940. On that day he transferred to the Polish Air Force. Glowacki claimed a Ju87 destroyed and a Do17 damaged on 15th August, three Me109’s and two Ju88’s destroyed on the 24th, a Me109 destroyed on the 28th, damaged a Me110 on the 29th, damaged a He111 on the 30th and destroyed a Me109 and damaged another Me110 on the 31st. On this day he was himself shot down. His Hurricane, V6540, crashed and burned out on the aerodrome at Gravesend. Glowacki was slightly injured and did not rejoin 501 until 10th September. He probably destroyed a Me109 on 18th September. He made his last flight with 501 Squadron on 24th September and from the 30th he was listed as non-effective sick. Glowacki was posted away on 2nd October 1940. He was awarded the VM (5th Class) (gazetted 23rd December 1940). In February 1941 Glowacki was posted to 55 OTU Usworth as an instructor. In October he returned to operations, joining 611 Squadron at Hornchurch, and was awarded the DFM (gazetted 30th October 1941). Commissioned in November, he moved to 303 Squadron at Northolt. On 27th April 1942 he claimed a probable Fw190 and on 19th August, over Dieppe, Glowacki claimed a Fw190 destroyed and shared a He111. He was awarded the KW and Bar (gazetted 20th August 1942) and the DFC (gazetted 15th November 1942). Glowacki joined 308 Squadron at Northolt on 7th February 1943 and remained with it until 22nd February 1944. After a trip to the USA he went to 61 OTU as a Flight Commander. He took command of 309 Squadron at Acklington on 9th September 1944. He was awarded two more Bars to the KW (gazetted 25th September 1944). 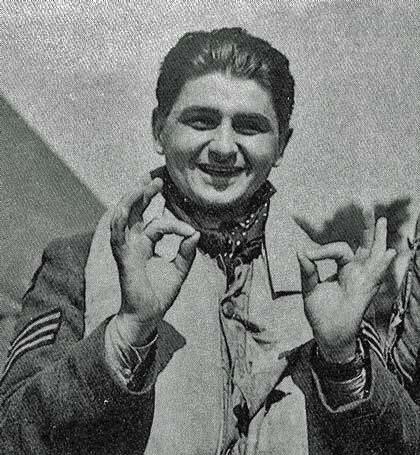 Glowacki was serving with 307 Squadron at Horsham St. Faith from 5th October until 29th November 1945, when he went to HQ 13 Group as a liaison officer. He remained in the RAF after the war. Glowacki transferred to the RNZAF in 1954, taking his family to New Zealand. In 1960 he joined the Department of Civil Aviation in Wellington and was responsible for light aircraft in the region until his retirement in 1975. Glowacki died on 27th April 1980.